You play as Snap, a Pokémon photographer who takes part in an on-rails safari through Pokémon habitats to take the best photos for Professor Oak before the end of the course. 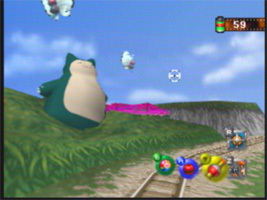 As you roll slowly through the habitats, various Pokémon will appear and you have to try and take a good photo. Larger photos with the Pokémon centered and facing you are best, with additional points available if there are multiple Pokémon in shot, or the Pokémon is performing an action. You can only get one score for each Pokémon in each stage. As you accumulate good scores, you earn extra equipment which can be used to make the Pokémon act differently and earn higher scores.